September is just days away, a month no more loved by parents than it's reviled by young adults for the very same reason: school. You've seen the ads, gotten the jingles stuck in your head – Back to School season is in full swing, and it's time to gear up. These days, parents and kids alike will agree that it takes more than a shiny new calculator to properly prep for the next year or two of higher education. And while those ads will show you things to buy, what they can't provide are recommendations based on expert testing and experience. When it comes to heady tech purchases, you can use all the help you can get – that's where we come in. 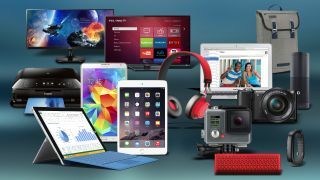 From laptops and tablets to printers and playthings to pass the time with, we've curated collections of some of the best bits of tech (and other gear) we've tested that will best serve your scholarly needs. You have at least five options in each category, so we've taken the guess work out of choosing the technology to see you through your next semester and beyond. And if you're on a budget, we've got a whole list of primo products just for you. With our handy guide, you'll enter the school year expertly equipped to both pass the tests and pass the time. Forget what you've heard: if you're serious about getting work done this school year, you'll need a laptop. Tablets have put a serious dent in the notebook, but they won't match the OG mobile computer's power, precision and pools of storage for a long, long time. And there is a laptop for every kind of pupil. Looking for an elegant mix of power and ease-of-use? You'd do well with a 13-inch MacBook Air. Need something that can run intense 3D modeling programs? Then a mobile workstation, like the Lenovo ThinkPad W550s, would serve you just fine. Even if you're on a seriously tight budget, you have options, like the Toshiba Chromebook 2. As you can see, there's a laptop for every kind of student. Luckily for you, we've sifted through the chaff to bring you only the best laptops for your next year of education. For the first time since Ancient Rome, tablets are what students bring to school instead of books. They're the new lightweight alternative to heavier laptops. Often thinner than a pencil, tablets from companies like Apple and Samsung slip into a backpack easier than most laptops with all of the apps you need for grade-A class work. This means taking notes, sketching diagrams and even whipping up presentations on-the-fly can be done on a device lighter than a textbook. The problem is, some student-marketed slates are better than others. There are way too many freshman who pick up an "affordable", off-label Android tablet only to realize that earns a failing grade from us reviewers. Don't be unprepared: we'll help you pick the best tablet for school whether you're in for an Ivy League education or opted for a way more fun state (party) school. You've heard it before: College is nothing like high school. You know what? They're right. It's better. Instead of hitching a ride to a friend's house for a game of FIFA or Call of Duty, your new best buds are right down the hall. And don't turn down the music at 11 – your night is getting started. But for as much as you're into games, Plex and rock 'n' roll, you'll need some super smart devices to make classwork easier and your schedule tidier than your room after a two-week grounding. We've packed some smart surprises into our list, like the Amazon Echo and TCL Roku TV. These brainy gadgets earned their doctorates in getting you the information you need and the entertainment you want with no need for a degree in technology. If you're constantly rushing to the computer lab to print assignments just minutes before class, you should consider buying a printer. There are a ton of affordable options on the market that are ideal for small dorms, cramped desk spaces and simple tasks, like printing Word documents. And with some models, you can print selfies straight from your smartphone, and you can even print small and large format pages for more complex assignments. The best part? You won't have to spend more than 100 bucks to find the perfect printing partner. You don't want to spend all of your time staring at an 11-inch laptop screen, especially if you're forever writing papers (or stalking your cute classmate on Facebook). Luckily, there are a ton of excellent and affordable desktop monitors that produce stunning images and fit perfectly in a small space. For around 200 smackers, you can buy a quality display that lets you watch movies in full HD, interact with a touchscreen, or edit papers well into the night with more brightness than you'll ever need. There are even best-in-class 4K displays available for slightly more dough, just in case you want to wow your new roommate with an amazing screen. Companies like Samsung, Acer, LG and Viewsonic continually update and refine their monitors, and we've handpicked the best, so be confident there is an option that's perfect for you. This is your year. Not only will you pass every class with flying colors, you will finally ditch those throwaway earbuds and stop using those dreadfully tinny laptop speakers for your music, movies and games. You deserve far better, and frankly, so does your media. It's time to compliment your shiny back-to-school purchases with some respectable audio equipment. Heck, even if you're still hanging onto the tried-and-true gadgets of yesteryear, the perfect audio additions will help you squeeze even more enjoyment out of your tech. Don't fret: it's not necessary to drop hundreds on quality sound and modern looks. Start the year off right with audio tech that will last longer than a semester and not cost a fortune. We've compiled this year's freshest-looking, value-packed headphones and Bluetooth speakers that are perfect for whether you're studying, exercising or throwing parties on the weekends (or weeknights). School is about creating memories that will last a lifetime, and there is no better way to preserve those moments than with a capable camera. Whether you're a thrill seeker shooting in the wet wilderness of your next adventure or trying to preserve a memorable date night, we know the cameras that will help you up your photography game. These aren't your dad's cameras either. With wireless capabilities built-in, you can still share these memories as you create them with no computer nearby. Just shoot, pair with your phone and share to your favorite social account – instantly and wirelessly. All good apps for students should do one thing: make their lives easier. Through the link below, you'll find five apps that do just that. Whether it's a way to pay for your share of pizza with your phone, a planner to make sure you never forget a class or the coolest note taker on campus, these apps will give you an extra edge in your academic endeavors. So, you've got all the essentials checked off, now it's time for the fun stuff. Here are some tech goodies that will enhance your experience away from home and make classes a bit easier. If your laptop dies mid lecture, try a smart pen as a back up. What if your phone dies on the way home from a party? You'll be glad you picked up a portable charger. To help motivate you to keep off the Freshman 15, you'd be smart to invest in a wearable to track your activity. With that, you'll also need to tote your tech around in a backpack that's both comfy and reliable. For all these things and more, just check out the link below. School is expensive. Believe us when we say "we get it." (My mortgage's worth of monthly student loan repayments will tell you as much.) So, we won't belabor you with product recommendations that are simply out of your price range. In need of a cheap, but effective, laptop? You're solid. How about something to stream your favorite shows that doesn't cost 100 bucks (or 100 quid)? Done. We could go on, but the point is this: if your book fees aren't leaving much room for anything else, don't sweat it. Just click away.